Full casting has just been announced for the West End transfer of Conor McPherson's play Girl from the North Country which originally opened at the Old Vic earlier this year. The West End transfer runs at the Noel Coward Theatre from 29th December 2017 to 24th March 2018. Joining the previously announced cast will be Finbar Lynch who will play Reverend Marlowe and Ross Dawes who will form part of the ensemble. 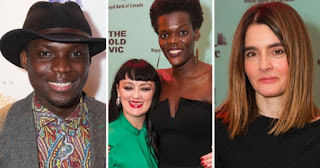 They will be joined by Hannah Azuonye, Mary Doherty, David Ganly as Mr Burke, Adam James as Dr Walker, Karl Johnson as Mr Perry and Emmanuel Kojo.They will jointhe returning cast which includes Sheila Atim, Ciaran Hinds, Shirley Henderson, Arinze Kene, Tim McMullan and Debbie Kurup.